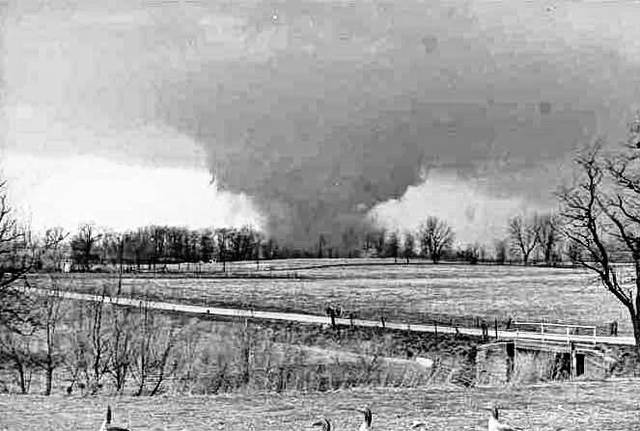 File photos The 1974 tornado heads toward Greene Memorial Hospital. 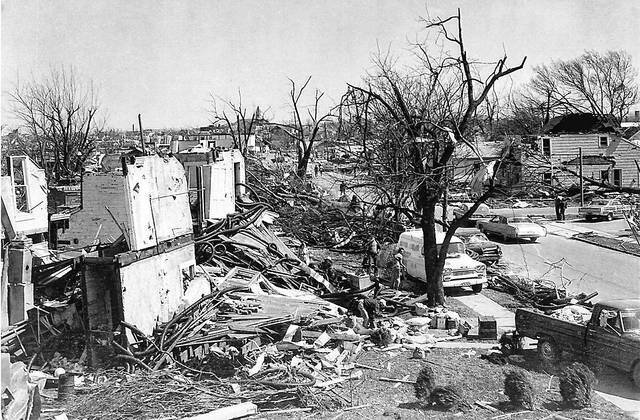 Wreckage from the 1974 Xenia tornado. This is a shot of the tornado taken by H.V. Noble from the family farm on Stone Road near Hook Road. According to Harry (Rip) Noble, H.V. Noble’s son, this may be the first time this photo has been seen publicly. XENIA — It didn’t last long. Maybe a couple minutes and it was over. But to many it felt like an eternity. 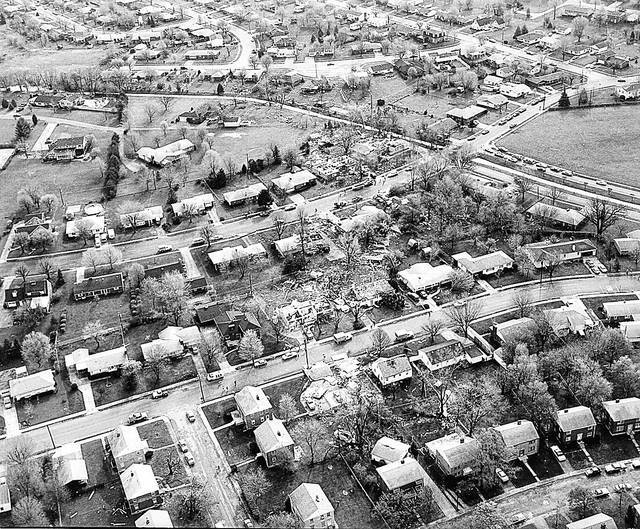 And in fact, the memory for some lingers to this day … 45 years after the City of Xenia was leveled by a powerful F5 tornado. The twister, part of one of the worst tornado breakouts in US history, injured 1,150 and destroyed around 1,400 buildings, about half of those in Xenia. Nine schools, nine churches and nearly 180 businesses were ripped apart. It was the second-largest tornado outbreak on record for a single 24-hour period and was also the most violent outbreak recorded with 30 F4/F5 tornadoes confirmed. From April 3 to April 4, 1974, there were 148 tornadoes confirmed in 13 U.S. states and Ontario, Canada. Tornadoes struck Illinois, Indiana, Michigan, Ohio, Kentucky, Tennessee, Alabama, Mississippi, Georgia, North Carolina, Virginia, West Virginia and New York. The entire outbreak caused more than $600 million (in 1974 dollars) in damage in the U.S. alone, and extensively damaged approximately 900 square miles along a total combined path length of 2,600 miles according to online reports. At one point, 15 separate tornadoes were ongoing at the same time. According to reports, the tornado formed near Bellbrook at approximately 4:30 p.m. As it moved to the northeast at about 50 miles per hour, it intensified in strength. The multi-vortex structure grew larger as it approached Xenia. It flattened the western part of Xenia. Xenia had no tornado sirens back then, but many were installed after, which helped alert residents to the September 2000 F4 tornado that hit the city, following a parallel path just north of the 1974 tornado path. “Xenians, grateful to be alive, took a look at their beloved city estimated to be at least half devastated, and began the gargantuan task of putting together a community again. Xenians bereaved by dead or missing relatives and friends were coming back from their shock and trying to keep busy today. The massive tornado left a lifetime imprint on those who experienced the terror. The casualties will mount over the next several days, it is believed. Hundreds of millions of dollars’ damage is more comprehensible to Xenians than the appearance. This city wouldn’t have looked any worse if a major battle in a war had raged through its confines. A total of 35 were killed — 33 the day of the tornado and two who who died later as a result of the storm. At the time the damage was estimated at $100 million, which would be closer to a half billion in today’s dollars. 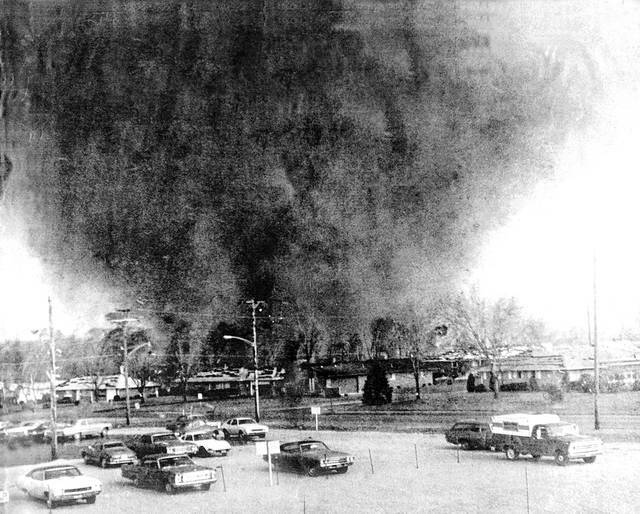 https://www.xeniagazette.com/wp-content/uploads/sites/32/2019/04/web1_tornado.jpgFile photos The 1974 tornado heads toward Greene Memorial Hospital. https://www.xeniagazette.com/wp-content/uploads/sites/32/2019/04/web1_tornado2.jpgWreckage from the 1974 Xenia tornado. https://www.xeniagazette.com/wp-content/uploads/sites/32/2019/04/web1_tornado6.jpgWreckage from the 1974 Xenia tornado. https://www.xeniagazette.com/wp-content/uploads/sites/32/2019/04/web1_Xenia-tornado-from-Stone-Hook-Road.jpgThis is a shot of the tornado taken by H.V. Noble from the family farm on Stone Road near Hook Road. According to Harry (Rip) Noble, H.V. Noble’s son, this may be the first time this photo has been seen publicly.